The award winning Wakami Wailers are scheduled to play an open air concert at Algonquin Park's Outdoor Theatre on Sunday, July 28, 2019 at 7:00pm. The Ontario-based Wakami Wailers will get your toes tapping through lively music sharing Canada's logging history, park and protected areas, plus much more. Join the Wailers for a fun-filled evening of entertaining stories and songs from their popular releases - The Last of the White Pine Loggers, Waltz With the Woods, and River Through the Pines. 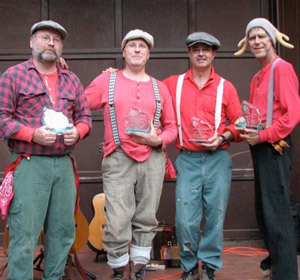 The Wakami Wailers will also be playing at Loggers Day on July 27, 2019 at the Algonquin Logging Museum. This concert is brought to you by The Friends of Algonquin Park as one of summer's Special Events. Admission to this event is a minimum donation of $2.00 per person. A 1997 interview with CBC's Newsworld about the formation of the Wakami Wailers and the history that inspires their music.